Located in the City but Big on Motocross and Enduro. Our Sales guys ride every day and our workshop is managed by KTM Orange Level Technician Scott Norman. Got issues with your KTM dirtbike? Come in and see what 40 years of experience in the dirt can do for you. Meet Braden, your new KTM Parts contact in Sydney. Braden is the KTM Parts Manager at Procycles St Peters. 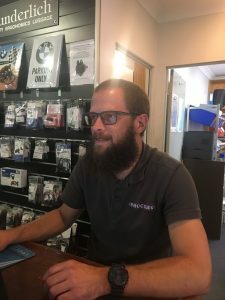 Braden has over 12 years parts experience and he has a huge range of KTM Dirt Bike and Street Bike parts in stock at 140 Princes Highway St Peters. YOUR KTM PARTS CONTACT IN SYDNEY. SAME DAY SERVICE. 12 YEARS EXPERIENCE. CALL HIM or CALL IN.